With the humiliation of a six goal deficit loss in the semi-finals to the Germans still fresh on their minds, the Brazilian national team took on the pitch for their 3rd place affair against the Dutch, knowing that this will be their only chance at some sort of redemption in front of their home crowd. The spectators seemed to feel the pain of their beloved squad, singing the anthem loudly with all the pride they had left after the disappointment of the prior match. In just the second minute, with Arjen Robben receiving a great through pass from Robin van Persie, Thiago Silva pulled the Dutchman from behind giving the Dutch an early penalty-kick. 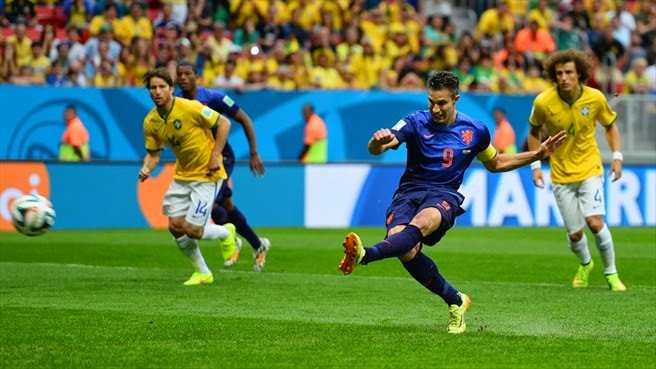 Van Persie was the man to take the spot-kick, and just like that memories of the shock loss to the Germany resurfaced. Silva’s pull on Robben may have been just outside the box, but a red-card was deserved on that play as Thiago Silva was the very last defender when he took Robben down. The referee however, decided to award the yellow. Five minutes later and Robben received a yellow-card of his own; suggesting that the referee on the day was going to reach for his pocket on any questionable challenge. , as more horrible Brazilian defending led to the Netherlands’ second goal, as Daley Blind picked up a loose ball in the Brazilian box and put it in the roof of Julio Cesar’s net for his first international World Cup goal. The next half-hour or so were quite uneventful, although the Dutch were looking the more dangerous side with some dominating midfield play. The Brazilians however, did not look as lost as they were after conceding two goals against the Germans, and did produce some “half chances” of their own, but without any success. Oscar seemed the bright spot in Brazil’s squad with a few good runs and moves just outside of the Dutch box, but even his shot, which was Brazil’s only one on goal in that time frame, was easily gathered by the Dutch keeper. In the second half the match took a turn to mediocrity, with both the Dutch and the Brazilians seemed content to slow the pace down. After a few half chances in the first 15 minutes, the score was still at 2-0, although possession was now swaying a bit more towards the home side. In the 67th minute, Oscar was taken down by Dutch defender Blind inside the Dutch penalty area, but instead of what seemed a sure penalty-kick, the referee decided to award the Brazilian young player with a yellow card. With a last gasp attempt, the Dutch would score their third and cap a miserable campaign for the home nation after a goal from Georginio Wijnaldum in added time, claiming the World Cup bronze medal. The Brazilians on the other hand, were losers for the second consecutive match on home soil for the first time in over 70 years and with their heads in their hands, the home squad would finish the competitions off with more questions than answers. Obviously all us were giving the hosts too much credit.